The current flock – Barred Rocks, Australorps, an elderly Buff Cornish and one Australorp/Delaware cross. My chicken-raising goals limit my choices to Australorps, Buckeyes, Delawares, Dominiques, Dorkings, New Hampshire Reds, Plymouth Rocks, Orpingtons, Rhode Island Reds and the Sussex. Although there are individual differences, all are dual-purpose birds with reasonable egg production and big enough to butcher for meat. All have been around at least 70 years (Delawares), and some have been around for many centuries (Dorkings). • Australorps, as you might guess from the name, were developed in Australia. The original stock came from Black Orpingtons, but they were crossed with Rhode Island Reds, Minorcas, White Leghorns and Langshans. Most of the latter breeds were known for egg production. The breeders’ goal was to develop a chicken that laid well in the hot Australian summers. Although an Australorp laid 364 eggs in one year during the 1920s, most chickens of the breed don’t produce that well, and the breed as a whole is not really outstanding in terms of egg production compared to something like the Leghorn. You can expect that they will lay about 220 to 280 eggs a year if well-fed and cared-for. They’re a reasonable size for butchering, at about six-and-a-half pounds for adult hens. They mature a little earlier than the average. Broodiness varies — the Australorps I had 20 years ago were a lot more inclined to set than the ones I’ve bought or raised in the last five years. They have black rather than yellow skin. • Buckeyes are an American breed, developed by Mrs. Nettie Metcalf of Ohio. They include Buff Cochins, Barred Rocks and game birds in their ancestry. Metcalf sent the Rhode Island Red breeders some of her stock, although the popular misconception is that the RIRs came first. They don’t lay quite as well as the other birds on my list; 200 eggs a year is the exception rather than the norm. They’re so-so in the broody department, according to my research. The bird is a deep mahogany red color with yellow skin. They’re very cold-weather tolerant and hardy. I don’t have any personal experience with this breed, but have talked to some people who do. • Delawares were also developed in America from crosses of Barred Rocks and New Hampshire Reds. These birds are almost pure white except for a necklace of black feathers and a few black feathers on the wings and in the tail. They have yellow skin. The Delaware was developed as a broiler and became really popular just about the time the Cornish Cross made its debut and took over the broiler/fryer industry. They lay almost as well as Australorps, and in my experience, about half the hens go broody. They also grow quite fast, which is an advantage for raising broilers and fryers. 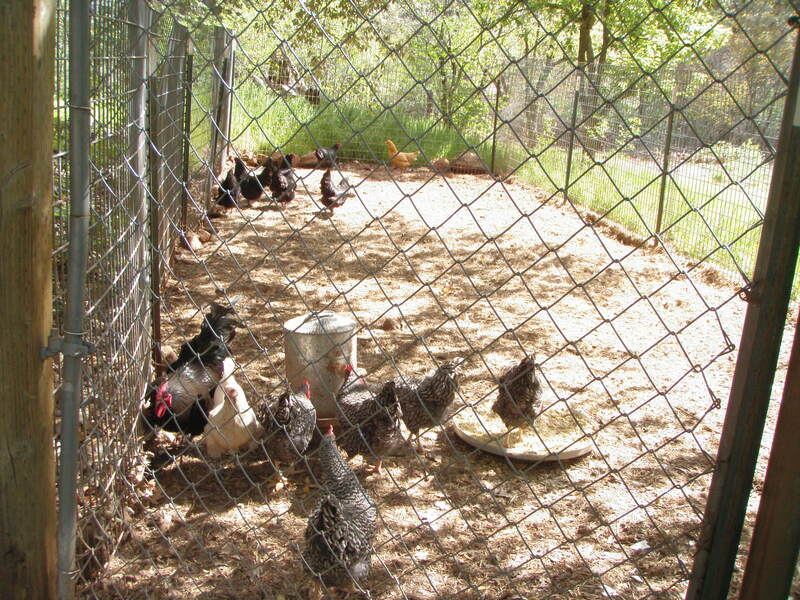 • Dominques are known as America’s first chicken breed. Also called Pilgrim Fowl, as they were developed in colonial times. No one knows exactly where they came from, although they’re supposed to have both European and Asian breeds in their background, including chickens from the Caribbean island of Saint-Domingue (Haiti). They look very much like a Barred Rock, with black and white feathers, and have yellow skin. They don’t lay as well as Australorps, but mature early and are good setters. They’re a little more high-strung than the others on my list, and Dominique roosters can be even more aggressive than Rhode Island Reds, which are known for this problem. • Dorkings are unusual in that they have five toes instead of four. This breed was apparently known to the ancient Romans, although it was developed in England. Primarily a table fowl, and prized for that feature, they lay moderately well compared to the other breeds on my list. Dorking pullets come into lay later than other breeds but they lay well through the winter. They are much more likely to be broody compared to the others and grow a little more slowly. Dorkings are multi-colored and also come in white; the typical rooster has a base color of black, red or brown but may also have yellow, white, buff or brown feathers. Hens are usually brownish-buff or grey with speckled patches and lighter-colored heads. They have yellow skin. A point against them is that the chicks are not very hardy, although the adults are fine. They fatten well. And I must admit, I like the idea of raising a truly old breed, with genetics that have never been commercialized. 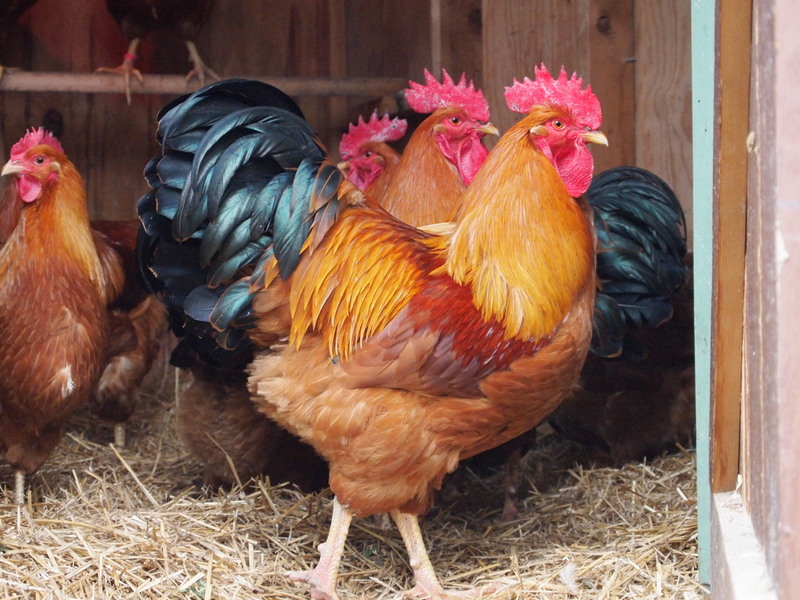 • New Hampshire Reds and Rhode Island Reds are marketed as dual-purpose birds, but I would say they’re more on the egg-laying end of the scale. NHRs were developed from RIRs. Frankly, I don’t think there’s a lot of difference between them these days, although they may once have been separate breeds. They lay more than Australorps, but don’t generally set well. They mature quickly, which is an advantage in trying to grow broilers and fryers. The biggest problem with these is that the commercial breeders got their hands on them, and it’s very hard to find a true strain of heritage red in either breed. A lot of commercial reds are basically red Leghorns — flighty and aggressive. 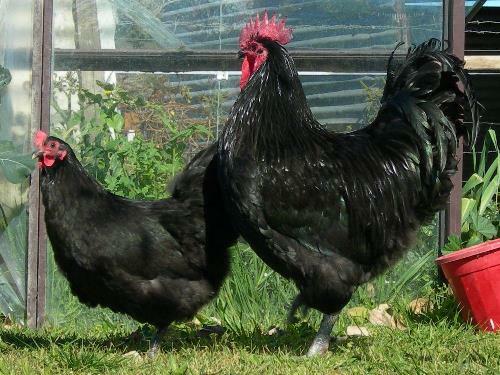 RIR roosters are notorious for aggressiveness, which is a problem when you have kids around the chicken flock. As you might guess from the names, their feathers are red — from a deep mahogany color to flaming scarlet — and they have yellow skin. • Orpingtons are an English breed developed primarily by William Cook and his daughter in the 1880s. They were originally bred to be meat birds and are still a good size, about eight pounds for an adult hen. They are on the low end as far as egg-laying, although the original Orpingtons were very good egg-layers; breeders began selecting for looks and egg production dropped. It might be possible to improve this with careful selection. They are generally good setters and mothers. Buff Orpingtons (a sort of light gold color) are the most common, but they come in other colors, including white. Skin is usually yellow to cream. The Buffs I’ve had were friendly and hardy. • Plymouth Rocks, or just Rocks, are another breed that comes in various colors. Black and white Barred Rocks and White Rocks are probably the most common. Developed in the early 1800s, by breeders who used Dominique, black Javas, cochins, Malays and Dorkings. The White Rock supplied half the genetics for the original Cornish Cross. They’re a fair homestead bird, although I don’t find they lay as well as the Australorp. I have not found them to be broody at all, and they tend to be more excitable than the other birds on my list. The hens weigh in at about seven-and-a-half pounds, and they’re solid, as a good meat bird should be. Although the original strains of Rocks were great farm birds, they’ve tended to be bred along divergent lines, with some being better for meat and some better for eggs. There’s really no way of knowing which type you’re going to get. • The Sussex was famed as a table bird in England, and is another very old breed. Sussex chickens were running around in Great Britain when the Romans showed up there in 43 A.D. The Light Sussex looks a lot like a Delaware, but they come in other colors as well. The Speckled Sussex, which is the most readily available, is usually reddish brown with black and white speckled feathers and yellow skin. Originally bred for meat, they actually lay about as well as Australorps. They don’t grow as fast as Delawares, but they are good setters and mothers. In my experience, they’re friendly birds that forage well. My top contenders are the Delaware and the Sussex. I have personal experience with both. Both come in white. They lay about the same number of eggs (Delaware brown, Sussex creamy to light brown) and both lay well through the winter. Both are hardy breeds that forage well. In my experience, they’re friendly and relatively docile birds, although we did have one Delaware rooster that was a little aggressive, especially as he got older. I never had any trouble with him, but he would regularly attack my husband. I found the Delawares matured more quickly than the Sussex, and although the Sussex is supposed to be more broody, I found them about equal in that respect. I’ve finally decided to go with the Delawares. My reasons are both practical and emotional, as most decisions are. The Delawares mature more quickly — a plus for meat birds. They’re more readily available (the most common Sussex offered is the speckled version, not the white). Finally, they’re an American breed from the state of Ohio, where my mother was born and raised. The next step in this process is to build new pens and coops. To be continued next week. This entry was posted in Farms, Food and tagged Australorp, chicken, Delaware, dominique, dorking, new hampshire red, orpington, plymouth rock, rhode island red, sussex. Bookmark the permalink.